The simple sentence It’s complicated has become quite a catchphrase these days. Facebook acknowledged as much when it added It’s complicated as an optional category under a user’s relationship status. When we respond to a question with the words It’s complicated, we are at least warning our interlocutor that there is no simple way to answer. Or we may be telling the person to bug off and mind his own business. Complicated means either “consisting of intricately combined or involved parts” or “difficult to understand.” But what about the word complex? Is it a synonym? The answer (of course) is yes and no. Complex means “consisting of interwoven or interconnected parts.” That means it’s virtually synonymous with the first definition of complicated above. If you are describing the inner workings of a cuckoo clock, a modern car engine, or an electron microscope, you might use either word. But it would be weird and confusing to describe your relationship status with the words It’s complex. This is because complex doesn’t necessarily imply the difficulty of explaining or understanding. And because saying It’s complicated communicates not just that there are details involved, but also that making them clear will require effort either the speaker or listener may not be willing to put forth. One comment I read about this topic on a linguistics blog suggested that complexity is generally intrinsic and complication is usually extrinsic. In other words,when we describe something as complex, we are talking about the nature of the thing itself, whereas something we describe as complicated may only be so as we perceive it. Or something may be made complicated by something external. That’s why, the argument goes, there is a verb form of complicated (i.e., to complicate) but not of complex. You can’t complex something, but you can complicate something. Hm. Makes sense to me. In real-world usage the two words are often considered interchangeable. 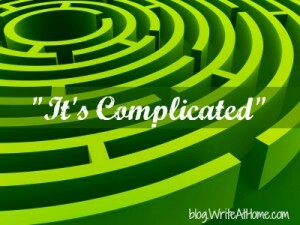 If you are a writer, however, you should be aware of the distinctions between complicated and complex. They are subtle, but not — you know — complicated. As always, I’d love to hear your thoughts. Leave a comment below.